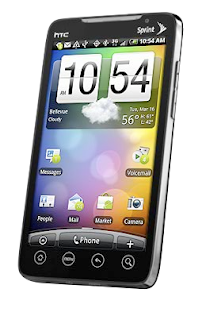 Sprint is releasing one of the first "superphones" June 4th: The Sprint EVO. What makes this phone so super? To start, it has a 4.3" touchscreen. Mmmm, nice and big. It has two cameras built-in, one front-facing camera for video chat (which can be done over Qik, Skype, etc. ), and an 8 MP camera on the back with flash. The 8 MP camera is able to record video in high-def (720p), and even sports HDMI-out for playing your videos on an HDTV or computer. Besides those lovely features, it will be running on Sprint's existing 3G network and their new 4G network, which is still being rolled out across the country. 4G is capable of speeds up to 10Mbps, wooo! That is faster than most of your home internet connections! Denver is on schedule to get 4G later this year. So, the phone has some nice features, but there is more... Sprint will be charging $10 extra a month for those that get this phone... grrr, but wait! The $10 a month will allow you to have unlimited data- literally. Not the "unlimited data, to 5GB" all carriers have now (anyone else notice 5GB as a limit? Yeah, that's funny...) Sprint will allow you to use all the bandwidth your heart desires. The EVO also comes equipped with free software to turn your phone into a 4G wifi hotspot, allowing up to 8 computers/phones to tether, right out of the box. Hopefully Sprint can force other carriers to offer similar deals. I figured someday I would go Android... that time may be coming sooner than I expected. Check out all the details on the Sprint EVO, here. Louis Ulysse Chopard, however rolex replica sale is actually present co president Karl Friedcrich rolex replica sale, that warrants the actual rolex replica sale score with regard to founding replica watches uk since the watch organization it is these days. Like the majority of replica watches manufacturers, the actual organization slowed up or even halted producing mechanised swiss replica watches at some time, especially using the introduction associated with replica watches sale.